The oldest Cistercian abbey of Lower Austria is among the few monasteries of Austria, that were never extinguished. 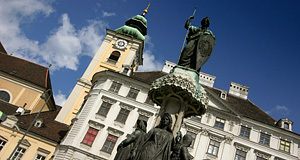 Its location south-west but near Vienna and Mödling makes Heiligenkreuz (http://www.stift-heiligenkreuz.org/) a popular destination for daytrips from the capital. It was founded in 1133 by Leopold III, similar to Klosterneuburg for spreading religious, cultural and intellectual life in Austria. In 1187, the Romanesque nave of the church was opened; it is still in place in its original style. Major extensions including the cloisters, some pillar courts and a well were added in the 13th century. Heiligenkreuz was very active with founding convents, a total of seven are foundations originating from here. It was also an exceptionally large monastery and continued to grow up to the late 19th century. In the Middle Ages, the scriptorium was influenced by the teachings of Bernard de Clairvaux and developed its own style for illuminations. Over the course of wars against Hungarians and Turks, the monastery was almost destroyed repeatedly in the 15th and 16th century. A fire did significant damage in 1683. Following this fire, the monastery got its current predominantly Baroque face. It has a centuries old tradition for music, most notably polyphonic music, its choir and its school theatre. In 1802, the convent founded a theological school and until today, it runs a boarding school. Visitors will enjoy the arcade courts, the church with its Romanesque core and Baroque interiors, most notably the choir stalls, and the Gothic cloisters. The tomb of Friedrich II der Streitsame ("the Quarrelsome") is in a hall. There is a museum associated with the monastery and a Calvary Hill. The library with 70,000 volumes and an important collection of Medieval manuscripts is not accessible. The Schottenstift (http://www.schottenstift.at/) is a Benedictine abbey in the first district of Vienna - the ancient city centre. It was founded by Duke Heinrich II Jasomirgott, who made Vienna his capital, in 1155. The first monks that arrived here were Irish and sent from Regensburg - therefore the somewhat misleading name ("Schottenstift" means "Scottish monastery"). The Romanesque church was opened in 1200, but burned in 1276. The "Scottish" (in fact Irish) tradition ended in 1418, when the monastery was populated again by Benedictine monks from Melk abbey - in the course of the Melk Reforms, the abbey would have been forced to accept non-Irish monks. They refused and preferred to leave. The monastery was important for Vienna′s intellectual life and had a close relationship with the nearby Vienna University and schooling, theatre and music. Its tradition in education is still maintained by the well-known Schottengymnasium that was founded in 1807 and the "Catholic Academy" that is run by the monastery since 1945. The Schottenstift got a Baroque face in the 17th and 18th century, minor extensions and refurbishments followed in the 19th century. Visits to the monastery are limited to Saturday afternoons. Sights are the church that includes the oldest Gnadenbild painting of Vienna, made in 1250. Famous noblemen and generals of the Austrian army are buried here, including Count Rüdiger von Starhemberg, as well as Heinrich II Jasomirgott and his wife Theodora.